Use EpiDerm to determine the skin irritation potential of extracts of medical devices. Skin irritation results are acquired within 3 days. 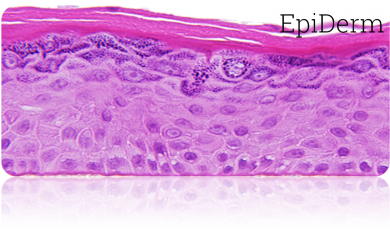 EpiDerm tissues are equilibrated overnight under standard culture conditions (37° C, 5% CO2, 95% RH) with EpiDerm Assay Medium (EPI-100-NMM). 18-24 hours later tissue culture supernatants are aspirated and replaced with fresh, pre-warmed media. Tissues are exposed to test material and controls for 18 hours. Following exposure, tissues are thoroughly rinsed and transferred to fresh prepared MTT solution to assess tissue viability. Culture medium can be collected for the optional analysis of cytokines. The determination of skin irritation potential of test materials is based on tissue viability. According to the Prediction model, an irritant is predicted if the mean relative tissue viability of triplicate tissues exposed to a test material is reduced below 50% of the mean viability of the negative controls. The EpiDerm Skin Irritation Test for Medical Devices (EPI-200-SIT-MD kit) is an in vitro method for the accurate and reliable prediction of skin irritating and non-irritating test materials. The results of a validation study conducted in 2016 and 2017 by 17 laboratories around the world, and several other scientific papers related to this project are now published in Toxicology In Vitro in a special issue dedicated to Medical Devices. Based on the results of this project, the Working Group 8 for Irritation and Sensitization of the ISO TC 194 on Biological and Clinical Evaluation of Medical Devices proposed a working draft of ISO guideline 10993-23 for Determination of Skin Irritation of Medical Device Extracts using RhE models.